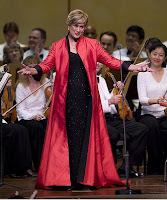 I have been a fan of Maori opera singer Dame Kiri Te Kanawa since high school when I first heard her beautiful soprano voice in the film "A Room With a View" singing Puccini's aria "O mio babbino caro". My iTunes library is full of her pieces and I've had the pleasure of hearing her sing in person several times. I can think of few individuals who have lived in two worlds as visibly as Dame Te Kanawa. She embraces her Maori and New Zealand roots boldly, has sung in operas and recitals around the globe, and today is one of the most beloved opera singers of all time. I recently came across this video below of Dame Te Kanawa singing "Tarahiki", an ancient Maori song/chant about the beauty and strength of the cicada dance. It totally blew me away. Read more about Dame Te Kanawa on her Kiri Te Kanawa Foundation website, her IMG Artists website, and Wikipedia. There are many more videos of her singing on YouTube as well. A couple other favorite vids of mine...Dame Te Kanawa singing "Pokarekare Ana" in 1990 and more recently for the NZ millennium celebrations. Great blog! I too appreciate the indigenous cultures of the world, in them lies the secrets to a natural human existence.